Creating UML use case diagram with free templates and examples. UML use case diagram has never been easier. A UML use case diagram summarizes some of the relationships between use cases, actors, and systems. A use case diagram can describe the different types of users of a system and the various ways that they interact with the system. This type of diagram is typically used in conjunction with the textual use case and will often be accompanied by other types of diagrams as well. With Edraw UML case diagram, you can easily discuss and communicate the scenarios in which your system or application interacts with people, organizations, or external systems; the goals that it helps those actors achieve; the scope of your system. Edraw helps you create a professional-looking UML Use Case Diagram easily and quickly. It provides plenty of pre-drawn shapes and a collection of automatic tools that greatly reduce the number of mouse clicks. The interface is straightforward and easy-to-use, no obscure commands to learn. There are some nice looking predefined styles, and you can also define your own drawing style through the setting of colors, transparency and lines. A good-looking UML use case diagram could be finished in just minutes. 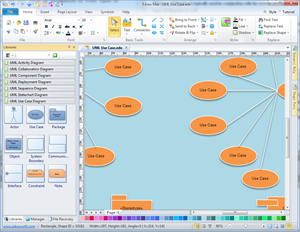 Edraw software includes many special shapes and symbols used in the UML use case diagrams, actor, use case, package, object, system boundary, communication, interface, constraint and note. You will find these shapes of great help when drawing the UML use case diagrams. 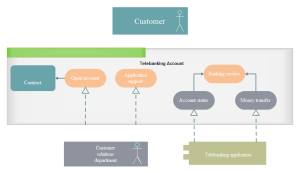 A uml use case diagram for telebanking is readily to help you make your own diagrams more easily and quickly. And it is editable in vector format so you can zoom it without losing clarity. 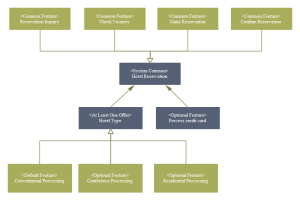 A simple but useful template of uml diagram about hotel reservation is embedded in the software. You can use it anytime you want and modify it in any way you like.